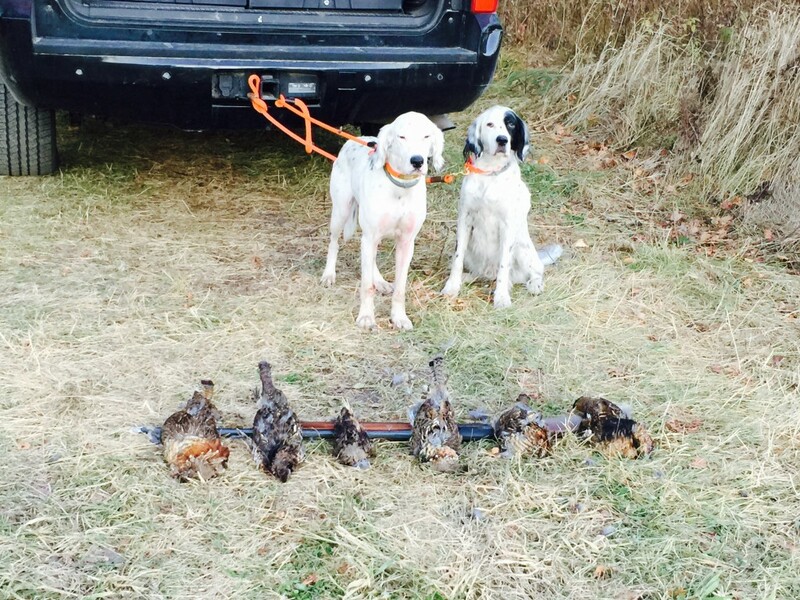 Bird Dogs Afield visits Bob Paucek the dean of New England bird dog trainers. This is Bob Paucek uncensored. Sunday was going to be over 70 degrees later in the day so we decided to go for a morning hunt. The first spot is an area that Tina had good luck with last year. It is a walkable trail with a variety of cover along the trail and at the end a smaller field that had been clearcut about 20 years ago. When we first hunted the area we could see all the way across the area with just small islands of trees that they had left in a few spots getting in the way. Now it is a bit of work to wind your way through it. We made it to the field without moving a bird but Tina was working well so I was confident that sooner or later she would find something. She can’t get through the thicker cover so I am sure that we are passing by a few birds but at this point it is about watching her enjoy her time in the woods. At the field she started to work more intently. We worked our way around the edge of the old cut and Tina was doing the start stop thing that usually means that there is a bird around. As we neared the back of the cut she locked up. I walked around one of the bigger clumps of trees to try to trap it between us. The bird got up from the clump to our right. I took a shot but did not connect. We reworked the trail back to the truck and Tina got two more points. One was behind a couple of downed pine trees and the other was another bird in a tree. It is crazy. I didn’t get off any shots. Tasha got the next spot. It is a Hunter Walking trail. It is one that hasn’t had any clear cutting going on for a while and the cover is pretty much past it’s prime. Last year we saw 1 or 2 birds each time though but not any bigger numbers. We were about 5 minutes into the trail when she went on point. It was and easy one. Straight away High House. Our first grouse was in the bag. We ended up working the trail for another hour before calling it a day because it was getting a bit toasty. We didn’t see any more birds. We loaded up and headed back to the cabin. I almost felt like throwing on the swim trunks and going for a swim. It was a decent start to our season. No crazy numbers of birds but we were at least seeing some. We left the Twin Cities Saturday morning and made the drive to the Deer River, MN area. By the time we hit the woods it was 1 PM and it was already warming up. Tina, the 14 yr old, got the first spot. It is a shorter hunt and we have had luck at this spot in the past. The cover was thicker this year than in the past and she had some issues getting through the tall grass in the trail. We worked the area for 40 minutes but didn’t move anything. Tasha got the next area. This spot is one of our two favorites. As we went down the second set of trails she gave me a flash point and a grouse took off out of a tree. It surprised me so much I didn’t even get a shot off. A few minutes later I heard her bell stop and then a grouse flushed. As it cleared the woods it was coming right at me down the trail. I spun around as it passed me and took a shot but it just kept going. It was in the mid 60’s and next to no breeze so I wasn’t going to get too upset with a bumped bird. I’m hoping that it won’t continue. As we went down the trail we had a wild flush that again came from a tree. arrgg, no shot taken again. The next section of trail was flooded out so we tried to work our way around it but ended up looping back to the original trail. We went to an area that was lower but not too wet and ended up moving two woodcock. One was a nice point but no shot and the other was another bumped bird. We wrapped up this area after about 90 minutes and took a break to head to the cabin and get checked in. I’ve rented the cabin for the month of October and will come and go over some long weekends. 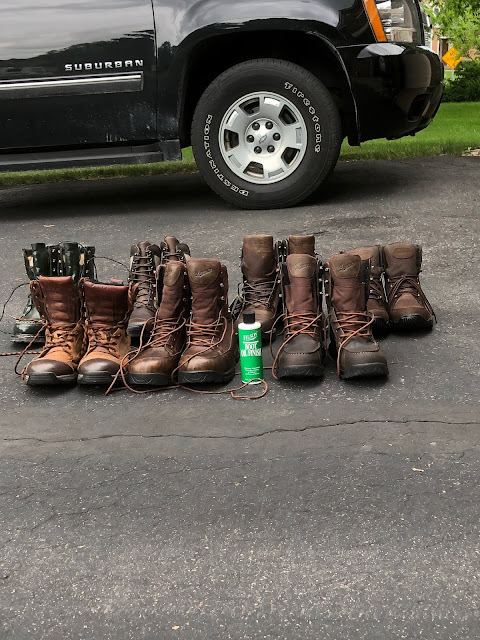 It is a bit expensive but this lets me leave a fair amount of gear at the cabin between hunts. Two main drawbacks though. No internet. No wifi at all and fairly slow mobile hot spot. It is good enough for email but no streaming. The second drawback is that after this year they won’t allow dogs any longer. We got checked in, got the dogs plenty of water, and unloaded some of our gear. We made it back out to the woods with about 2 hours of light left. We went back to the 2nd spot that we had hunted and I took Tina out first again. We worked a great looking section of trail. This was much easier walking and the cover has grown nicely since being clear cut a few years ago. She got birdy a few times but we didn’t move any thing. Tasha got the call to close out the day. We ended up moving 4 more grouse 2 of which came out of trees. She did get a nice point on 2 woodcock. I didn’t get a shot off at the first one but the second one was a nice point and when I stepped into the woods it flushed and went right down the trail and I hit it on a nice going away shot. We got out of the woods with a little light left. We ended up moving 7 grouse and 4 woodcock for the day. It was great to see birds even if we didn’t do too much shooting. I’ve been slacking off on keeping the blog up to date but we had such a good day hunting that I thought today would be the right time to get it all rolling again. We drove from St. Paul up to the Deer River area this morning. It was gray and kind of gross looking when we started at 2 pm. I wasn’t too hopeful. I put the 13 yr old setter Tina down first. We started down the first trail and she was working scent pretty quickly. She made a nice point on a woodcock but I couldn’t connect. The trail comes to a T and we usually go to the left but Tina decided to go to the right and locked up within 15 yards. I walked in and could see the grouse holding tight by a pine tree. Three steps in and it jumped up and with one shot it came down. As we doubled back down the trail we worked for a good period of time. We had a tailwind and Tina was working hard but wasn’t having much luck until we hit an area that is a bit wetter and Tina swung to a stop after she had passed by the area. I walked in and the bird went straight away and I was able to bring it down. 100 yards later it looked like the situation was about to repeat itself but as I walked in for the flush I only managed to shoot a tree in half… We made it to the end of the trail and turned around and worked our way back. Towards the end of the trail Tina went into the woods a little bit farther than usual. I heard her beeper go off and I started to walk towards where I thought she was on point. I couldn’t see her but I thought I was getting close. I was about to activate the beeper again to get a better idea of where she was when I heard a leaf make a crunchy noise and the grouse came up and I was able to snap off a shot and bring it down. When I picked up the bird I could tell that I had just hit the wing. Covering the last bit back to the truck I missed on a wild flush. After loading Tina into the truck and swapping out the 12ga for a 20ga Tasha and I started back into the woods. The first spot that we hit was an area that had been cut over 4 or 5 years ago. We haven’t moved many birds out of this area yet but it doesn’t take to long to hit it. A short walk into it Tasha pointed and then relocated. When I walked in a woodcock went up and I took an off balance shot and was lucky enough to connect. Tasha went right over to where it went down so we didn’t lose this one. She has been getting better about going to where the bird has gone down. We finished up this area and hit a spot that usually holds a few woodcock. She had a nice point but it flushed low and straight away from her so I didn’t get a shot off. We continued to work the area and at the very end of the cover she locked up again and the grouse came up and offered me a straight away shot and I was able to hit it on the 2nd shot. We doubled back and started to work part of the area that we don’t hit too often. It is a bit older growth but we have been seen birds in this type of cover in other areas that we have hunted this year. We hunted this area for quite awhile but didn’t get any action. We worked our way back towards the area that I had hit with Tina in the hope that more birds had moved in. Just a few minutes down the trail and I got a nice point and I brought down grouse number 5. We hunted for a bit more trying to get Tasha some more woodcock points but didn’t move any more. About 50 yards from the truck Tasha busted a grouse. Oh well, it wouldn’t be a hunt without one busted flush. I checked my hunting log and the last time that we had filled out on grouse was 4 years and 1 day earlier and it was in the same spot.